I recently attended a bloggers' gathering for ZA's newest products. One of the ZA's product that caught my attention, aside from the ZA Perfect Fit Two-Way Powder Foundation is their smudge-proof yet easy-to-remove by warm water called ZA Perfect Action Mascara. I have used this mascara for a couple of weeks (trust me, you just don't know how crazy I am in testing products! I wear them even at home! lol). Today, finally! I'm ready to share my review on my first ZA mascara! Oh, before I continue, girls who aren't comfortable using non-waterproof mascara formulation, ZA Perfect Action has a "waterproof" version! :) The packaging is black and blue. The first ZA mascara I've tried, the Perfect Action mascara is an all-in-one mascara that gave my lashes both volume and length. For the affordable price, it was surprising to see that it created upturned, dense, and long lashes while effectively separating them with no clumps. The flat wide brush delivers ZA's unique Long Stretch Fibers, adding length to the lashes. The moisturizing collagen is gentle enough to be used even on the most sensitive eyes. Cute black and gold packaging. Lashes appear thicker and a tad bit longer. Formulation is just right, not too dry or wet. 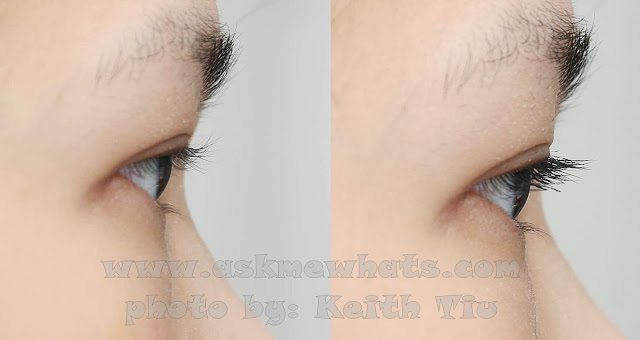 Due to the additional fibers, it may weigh your lashes down. Smudgeproof formulation - easy to remove but very oily-lidded individuals may feel more comfortable using the waterproof version. A smudgeproof, smear-proof mascara that is easy to use and remove. I like to use the flat side of the brush first and comb through your lash hair starting from the roots to tips with a zig zag motion. 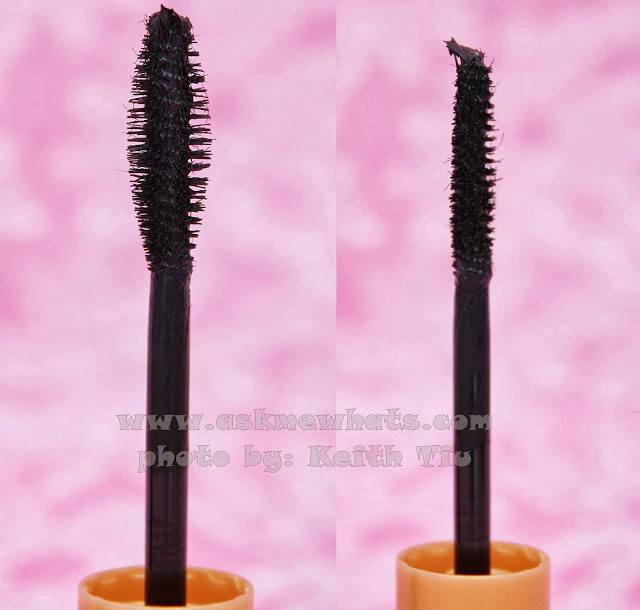 Use the side of the mascara wand for 2nd or 3rd comb to separate lashes preventing clumps. If you suffer from super oily lids, go for the waterproof version. Though this can be removed by lukewarm water, I still prefer to follow up with a gentle eye makeup remover just to make sure there's none of the mascara residue that may cause allergic reactions. Girls who like to use a simple mascara that gives volume and definition minus the "fake" effect. The non-waterproof version is best used by girls with not so oily lids. Available in leading Watson's outlets and SM department stores nationwide. The flat portion is best used at first application to ensure all lashes are coated evenly. The additional "fibers" will help lashes look thicker. Flip the wand on the side (Tapered side) to help comb through each lashes for wide-eyed look. I like to use the flat portion of the brush and apply starting from the roots with a zigzag motion. What I like about ZA Perfect Action Mascara is how natural it looks, I did not apply any liquid liner but my eyes look more defined. I did not curl my lashes on before photo. ZA Perfect Action mascara definitely added extra volume and definition on my almost non-existent lashes. Lengthening factor is not bad! Because of the extra fibers that gives volume to my lashes, it weighed down the natural curl of my lashes (a bit). I highly recommend to curl your lashes well prior to mascara application. What are you excited about the new ZA Perfect Action Mascara in Smudgeproof formulation? I am most excited about the fact that it stayed the whole day without smudging yet, it can easily be removed by warm water at the end of the day. thanks for the hugs! and yes, waterproof din ang peg ko but on days I know I will be inside an airconditioned room lang, it's time to let your lashes breathe :D kaya this is great! I love volumizing mascaras so i guess this one would definitely work for me. give it a try! :) Goodluck! Give it a try and have a look! their price points isn't bad! !